I guess some of you are a bit unhappy about how I closed the last installment. And you probably won't like me any better when you realize that the first paragraph still doesn't dive into the topic I put on hold last week... But what can I say, that's just the way I am. …the one-legged man doesn't work faster. Why the hell should you rack you brains with all these phase issues when I told you last week that you can always solve them in the mix stage? Well, once again, to comply with the sacred Golden Rule #1. In fact, if you don't think about it when you are tracking, you won't really know what you'll have to face when combining the tracks during mixdown. It would be like a painter expecting to get a very specific shade of blue combining random paint tubes. Even if he is really attentive when mixing them, chances are he won't get the blue if he uses red and black. Well, it's exactly the same here. Making sure that the combination of tracks you are recording actually corresponds to what you expect to get for the song you are working on is the best way to avoid making your life impossible during mixdown. Yes, I know it's obvious. But I nevertheless want so stress this fact because I'm among those who wouldn't come around this obviousness when I started out, and trust me, more than once I wished I had! Better safe than sorry. Okay, the time has come to talk about the "poor man's method" I told you about last week. Which is quite simple actually. Once the bass is ready to be direct recorded and the mics are in place in front of the amp, ask the bass player to play one single note. And record it. When you're done, in your DAW you will be able to see that there is a small time gap between both tracks, which is what results in phase issues. But insert a sample-precise delay plug-in on the track or tracks in advance. If your DAW doesn't have such a tool, you can use Voxengo's Sound Delay freeware. Then, adjust the delays so that there are no artifacts. A trick to get this done quicker is to reverse the polarity of the "reference" track, the one without delay that is, and adjust the delay of the other track(s) until the bass can't get any thinner. Now switch back the polarity of the "reference" track and you should get an optimal bass sound. If you are not satisfied with the result, move the mics around and start over again. Once you get used to this, it shouldn't take you more than a couple of minutes and you will make sure that what you record always corresponds to your expectations. 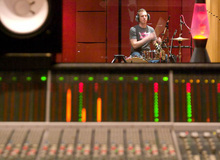 And you will be able to carry on with your recordings without any major concerns.